Jupiter is the ruling planet of the zodiac sign of Sagittarius. It is one of the brightest objects in the sky and can be seen with the naked eye. The Romans named it after one of their gods. It is said to bring feelings of positiveness and optimism if in your sign. It is the fifth planet from the sun and is absolutely huge – it is, in fact, the largest planet in the Solar System. 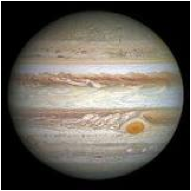 Jupiter has the shortest day of all the planets – it orbits the sun only every 11.8 earth years. It has unique cloud features. It has a radius of 69.911 km. It is 778.5 million km from the sun. It is a very windy planet. It is known for the giant red spot, which is a spinning storm like a hurricane and is three and a half times the diameter of Earth. The planet has a small rocky core – the mass ten times less than the Earth’s. It is surrounded by dense liquid hydrogen that is ninety per cent of its diameter. One year on Jupiter is twelve years on Earth. It spins at 28,273 miles per hour, which is almost 28 times the speed of the Earth. Jupiter has four sets of rings. Nine missions have visited Jupiter over the years.